is a One Way Ticket! NIHL is related to both noise intensity and the duration of noise exposure. Simply put, the louder the sound, the shorter the time before damage occurs…and the relationship isn’t linear! Here’s an important take-away: NIHL is irreversible and your natural hearing cannot be restored by medicine, surgery, or hearing aids. There may be treatments that can help you understand speech better, but NIHL can only get worse with time…when the damage is done, it is permanent! The Figure (top, left) illustrates the path of sound waves through the cochlea, where they are converted to electrical impulses before heading on their merry way through a nerve network called the auditory nerve. The final destination for the electric impulses is the Auditory Cortex of the Brain, where they are processed and (hopefully) interpreted as the sounds and speech that we hear. The figure insets show hair cells damaged by noise loudness and exposure over time compared to healthy hair cells. These hair cells are extremely delicate, and easily damaged …permanently! The video (top, right) discusses NIHL from an industrial job safety perspective, but also has great appeal for general safety. Get to know us...you will like us! Meet our friendly team of Doctors and our professional support staff. Our primary team goal is to help you feel younger and more active. We've done it for many others, and we are confident we can do it for you! Are we delivering the goods? We now have more than 500 5-Star Reviews. 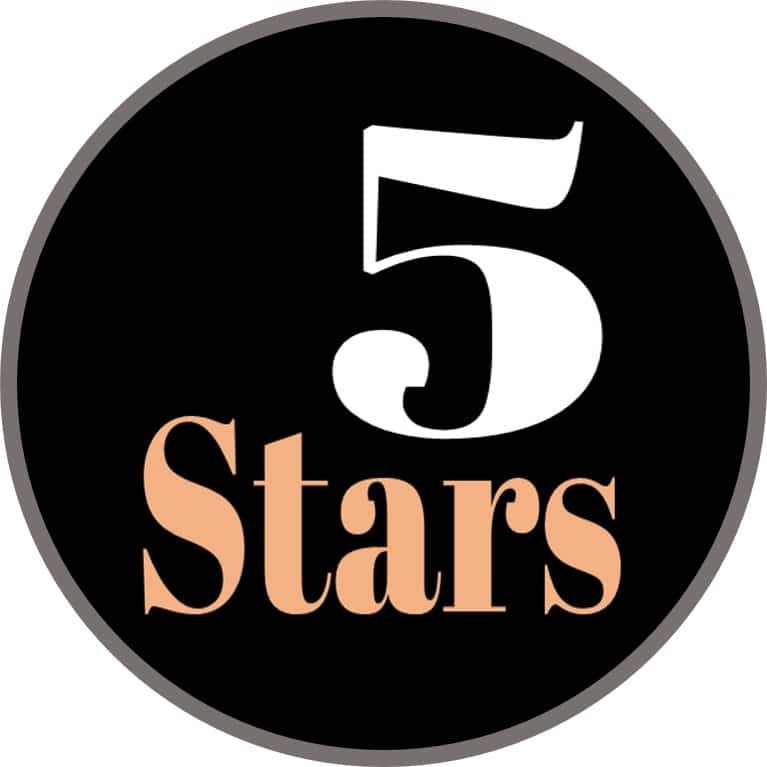 These reviews will tell you everything you want to know about our staff …our services …our clinic …and our successes. Our customers have high expectations and we deliver! The Table (below) shows how quickly sound tolerance limits decrease with small increases in sound intensity levels. This is because an increase of 10 dB corresponds to a 10 fold increase in sound intensity. 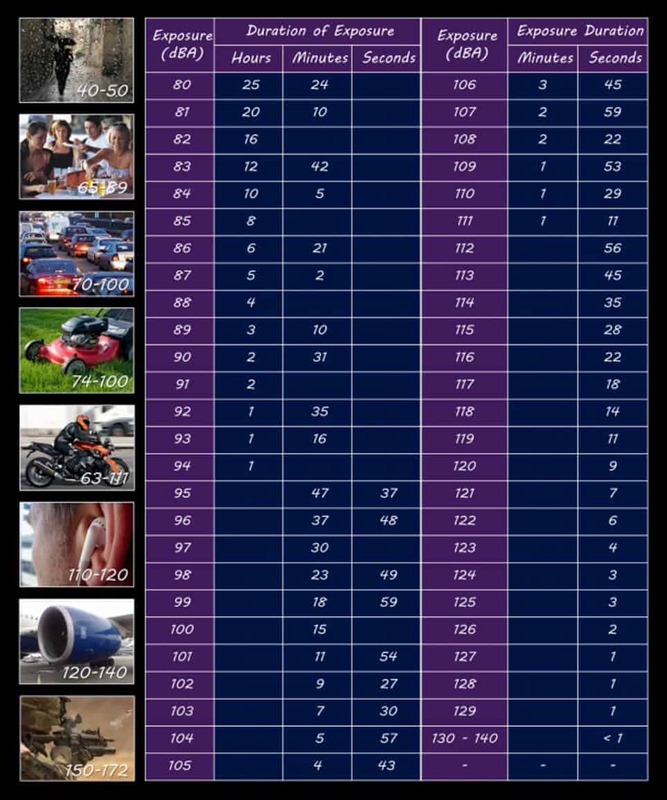 To put this in perspective, the sound of an MP3 player set at a maximum volume of 115 dB is approximately 1000 times more intense than a vacuum cleaner producing a sound volume of 85 dB…and a loud rock concert can produce sound levels (120 dB) that are 1 trillion times more intense than the softest audible sound (~0 dB)! It’s important to understand that, NIHL is completely preventable! Our advice: be mindful of noises that can cause damage (those above 85 dB), your proximity to the noise, and the length of time you are exposed to the noise. Be especially wary if you have to raise your voice in normal conversation, if the noise hurts your ears, if you develop a continuous or temporary buzzing or ringing in your ears, or if normal hearing isn’t restored within several hours of noise exposure. Remember, NIHL is permanent …and irreversible! 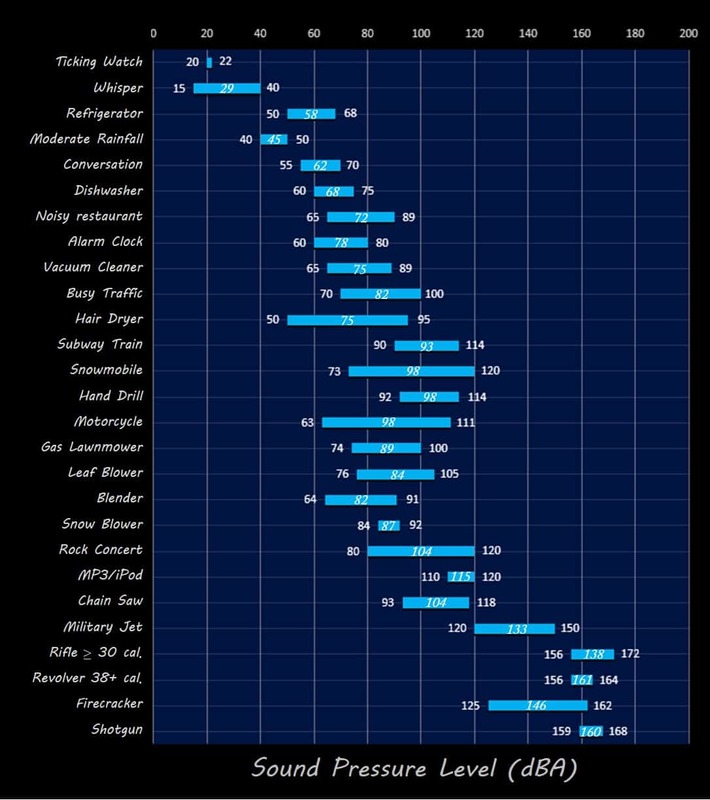 The Table (below) shows the intensity range of everyday sounds. We prefer to use sound intensity ranges rather than absolute values because 1) everyday sounds are better represented by a range and, 2) the difference between the low and high ends of a particular sound range can mean the difference between a relatively safe or a harmful experience. For example…a musical concert can range from 80 to 120 dB. You can listen to 80 dB all day without any risk of NIHL…but if the band is blasting out 120 dB you can safely listen for less than 9 seconds before NIHL becomes a serious consideration…depending on how close you are to the speakers. You can see from the table, that some every day items have a large range of sound intensities. A hair dryer can range from 50 dBA to 95 dBA and a snowmobile can range from 73 dBA to 120 dBA. You might want to consider sound intensity before you purchase products. The Bottom Line: The preceding tables indicate that long or repeated exposure to sounds at or above 85 dB can cause hearing loss, and progressively louder sounds allow shorter exposure limits before NIHL occurs. Noise and NIHL studies indicate that more than 15 minutes of unprotected exposure to 100 dB sounds, and regular exposure to sounds at 110 dB for more than one minute can lead to permanent hearing loss. Although we can’t provide absolutes for decision making, the tables can provide important guidelines. If you plan to participate in activities that can produce sound intensity levels above 85 dB…be mindful of your exposure time and proximity to the noise source. When in doubt…use ear protection. 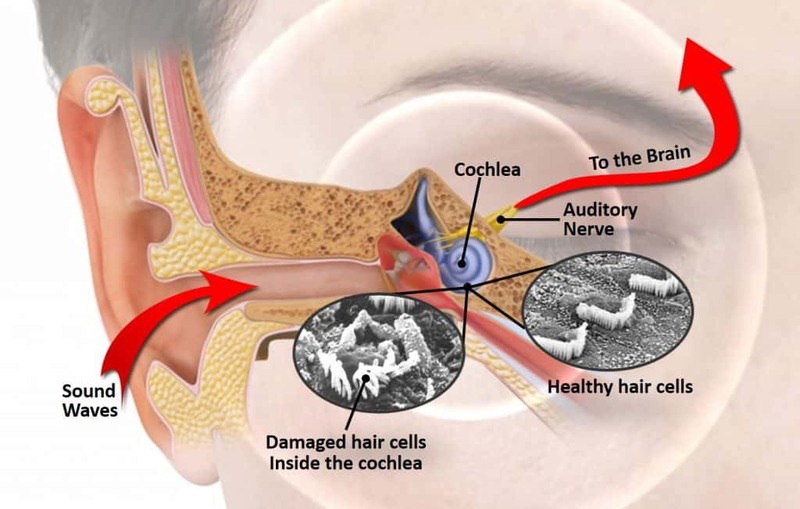 Remember…Noise-induced Hearing Loss is nonrefundable! Now More Than 750 5-Stars! Great serviceMy visit to PNWA resulted in a very pleasant and productive surprise: her name is Becky. This intelligent and personable young woman really helped this old guy and his wife understand what his hearing problem results from and how best to deal with it, As I told the young lady as we were leaving, I'm sure she has many employment options, but I sincerely hope that she remains with PNWA. She is a keeper! LYRIC FOLLOWUP SERVICEI hope with the time the Lyric representative spent trying to fit my Lyric hearing aids so the feedback is eliminated will help. It has been frustrating to have go back more often than I used to have to do to replace dead or aids which after several weeks start to develop feedback issues. Other than that everything is still great. Life Is Better With Better Hearing!